The three accounts are amazingly similar as they record the same basic testimony about the life and death of Jesus. But there are a few distinct differences between the three witness accounts from antiquity. I’ve highlighted or colored the differences to make them easier to discuss. First, you’ll notice the hostile gentile witnesses are silent on a few important points (there is no mention of the prophecies predicting Jesus, the triumphal entry into Jerusalem, Judas Iscariot, the beating prior to the crucifixion, or the resurrection or ascension). But this does not necessarily mean there is a contradiction with the Jewish witnesses or the Biblical account. It may simply mean ancient Gentile writers assumed their readers knew these issues, were themselves focused on other issues, or did not carefully guard the entire record (and as a result, some have now been lost). In addition to this, you’ll note there are some dramatic differences between the Jewish account and the Gentile and Biblical record. The difference here is not in terms of the historical details of the story of Jesus, but is instead in the explanations for these details. The Jewish record affirms Jesus was said to be born of a virgin but denies this claim, arguing Jesus’ parents simply covered up the truth about Jesus’ true father. The Jewish record affirms Jesus had supernatural powers, but attributes these powers to demonic forces. Finally, the Jewish record also affirms there was an empty tomb (and Jesus’ followers claimed he was resurrected and ascended into heaven), but they deny this was true, and claim Jesus’ grave was later found in the garden next to the tomb. So while the narrative of the life of Jesus closely parallels the Biblical account, there are a number of alternative explanations offered. So, which of the ancient records are we to believe? Why should we accept the Biblical account when there are clearly a number of other witness records available? What makes the Bible more trustworthy than the other witnesses? When a prosecutor brings an eyewitness into a courtroom, he or she needs to be very careful to bring best eyewitnesses available. After all, these folks are eventually going to be cross examined by the defense attorneys. So, prosecutors evaluate their witnesses using the four pat template I describe in Cold-Case Christianity. Let’s take a look at the criteria for reliable eyewitnesses and see if the Biblical record compares with the other ancient witness accounts. 1 – Were the Witnesses Even Present? No gospel in the Bible mentions the destruction of the temple in 70AD in Jerusalem (an event that would surely have been mentioned had it occurred prior to the writing of the Gospels), inferring these gospels were authored earlier than 70AD. The Book of Acts ends with Paul in captivity in Rome, prior to his execution (which historians date between 62-64AD). This reasonably indicates the Book of Acts was written before 62AD and the Gospel of Luke is written sometime before that. Many conservative scholars date the Gospel at about 55-60AD. In addition, Biblical scholars and critics alike believe Mark precedes the other Gospels, meaning it has to be written prior to 55AD (much of Mark’s Gospel is mentioned in Luke’s account). So by dating in reverse order, we can reasonably infer the Gospels are in fact written within the lifetime of eyewitnesses who could either verify (or falsify) the accounts. By comparison, consider the Greek researcher and storyteller Herodotus of Halicarnassus (fifth century BCE), who is considered to be the world’s first historian. In “The Histories”, he describes the expansion of the Achaemenid empire under its kings Cyrus the Great, Cambyses and Darius I the Great, culminating in king Xerxes’ expedition in 480 BCE against the Greeks. Secular historians believe this is reliable history containing a reliable description of the people the Persians conquered. Yet the work of Herodotus is not nearly as well documented as the work of the New Testament writers. Our earliest copy of “The Histories” (written allegedly in 480 to 425BC), dates at 900AD. That is a 1,350 year gap. The earliest New Testament fragments date to within 25 t0 50 years of the writing and our earliest complete manuscript of the New Testament dates to within 300 years of the writing. There are only 8 ancient copies of “The Histories” to compare to one another, while there are over 24,000 ancient copies of the New Testament to compare to one another. The Biblical eyewitnesses were not only present to observe Jesus, they wrote and preserved their eyewitness testimony in a manner unlike any other ancient eyewitness. When examining the ancient hostile Gentile accounts of Jesus, it is difficult to know whether the witnesses were actually present for much of what they describe. They date fairly close to the life of Jesus (far closer than the Jewish accounts), but they were certainly not as intimate with the historical figure of Jesus as were the disciples. But it is important to note the Gentile witnesses don’t disagree with the Biblical account in the first place. The Jewish record related to Jesus is clearly reactionary. There is no evidence to suggest any of these witnesses were present to actually know or see Jesus, although this is quite possible. The Jewish record admits and confirms much of what the Biblical record proposes about Jesus. But remember the earliest record in the Talmud dates to 500AD and the earliest record in the Toledot Yeshu dates to 1000AD. These are both very late. While some of what the Jewish witnesses say may be true, they are clearly a later account of the life of Jesus and therefore are a less reliable account. It is also interesting to note the nearer the Jewish witness to the life of Jesus (i.e. Josephus), the more flattering and similar the description to the Bible. As time passes from the life of Jesus, the Jewish Record deviates from the Biblical account. 2 – Are the Witnesses Supported Externally? It’s hard to deny the archaeological corroboration of the New Testament Biblical record. When Biblical writers describe a city, it can be located on a map and in the archeological record. Unlike other scriptures from other faith systems, the New Testament is more than a collection of sayings. It is, instead, a description of history, and the geography described in the Bible actually exists in the archeological record. While this does not prove the Biblical writers were telling the truth about Jesus; it does lend support to their reliability. And in addition to the archeological verification, there are also Gentile and Jewish writers who confirm the details of the Biblical account on many important topics. Again we need to recognize the Gentile account does not differ from the Biblical account on the key points. It does not, therefore, have to provide external archeological verification to prove its reliability in making an alternate claim, because it does not make an alternate claim capable of being examined with archeology. But there is one important differing claim related to the explanation of the darkness at the crucifixion. The Gentile witness (Thallus) argued the darkness was caused by a solar eclipse. The problem for this explanation lies in the scheduling of Passover, however. The Jews scheduled the Passover during a full moon, and a full moon occurs when the moon is on the “back side” of the earth. This means the earth is between the sun and the moon, making it impossible for a solar eclipse to occur (a solar eclipse can only occur when the moon passes between the sun and the earth). Astronomical records show no solar eclipse occurred anywhere near the city of Jerusalem during the years of 30-33AD. So the Gentile account of the event does not have external support. The Jewish account also makes alternate claims related to several key points. This account alone argues there was a grave in the Garden adjacent to the tomb and it was here the gardeners buried the body f Jesus. It also makes claims the body was exhumed and presented to the ruling authorities. If this were true, we would expect important archeological artifacts to have been preserved by the Jews. After all, there would be a strong desire amongst the Jews to squelch the upstart Christian faith, and all it would take is the preservation of the body of Jesus to do just that. In addition, while there are present day archeological sites throughout Jerusalem verifying the details of the crucifixion story, including the location of the crucifixion, the garden and the tomb, there is no historically identified location for Jesus “true” grave in the garden. One would think the ancient Jews would monumentalize this site and cite it down through history in a manner similar to the way modern Christians have carefully preserved the archeological history of Christianity. Without this preservation, the Jewish account has no external support. 3 – Have the Witnesses Been Honest and Accurate in the Past? 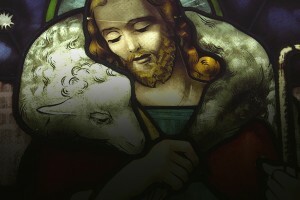 Many of the Gospel details related to the life of Jesus have been questioned by critics of the Bible. Skeptics have argued there was no recorded census at the time described in the Bible, no record of a governor in Syria named Quirinius, and no tradition of requiring people to return to their ancestral home for purposes of recording their numbers (these details are mentioned in Luke 2:1-3). But archeological findings have now revealed the Romans regularly recorded the enrollment of taxpayers and held censuses every 14 years (beginning with Augustus Caesar). In addition to this, an inscription found in Antioch tells of Quirinius being governor of Syria around 7 B.C. (evidently he was governor twice.) But that’s not all. Archaeology has proven the Biblical writers to be correct about hundreds of other details once questioned, like the existence of Lysanias (Luke 3:1), the existence of court called “the Pavement” (or “Gabbatha” as mentioned in John 19:13), the existence of Pontius Pilate, the details of Roman crucifixion, the existence of the city of Iconium (Acts 14:6) , the existence of the proconsul named Sergius Paulus (Acts 13), and the existence of a man named Gallio (Acts 18), to name just a few. Critics once thought the Biblical writers to be either mistaken or lying about these details until archeological finds in the last two centuries proved the Bible to be correct. If the Gentile account is wrong about the eclipse, we have good reason to be skeptical about the claim. On the other points of similarity with the Biblical record, there is no reason to doubt the truthfulness of the account. One way to examine the accuracy of this record is to measure what it says about the teaching of Jesus against who it says was empowering Him. There definitely seems to be an internal contradiction here. The Jewish writers call Jesus a wise man and a teacher who healed the lame and worked amazing deeds. At the same time, they claim he was a liar who was empowered by demonic forces. How can both descriptions be true? Do wise teachers lie? Do the demon possessed heal the lame and perform amazing deeds? There is an internal contradiction in the account. 4 – Do the Witnesses Have An Ulterior Motive? James, son of Zebedee, was beheaded in Jerusalem by sword (Acts 12:1-9). John was banished to the Isle of Patmos in 96AD (Rev. 1- 9). The Biblical eyewitnesses lacked the three motives we expect to see in those who lie. They gained nothing financially, and were not driven by sexual desire or the pursuit of power. The Gentile witnesses are clearly motivated by their animus toward the growing nuisance the Christians had become in the Roman world. They are indifferent to Christian spiritual claims, but are more concerned with how the upstart Christians were behaving in the Empire and growing threat they were posing. Maybe that’s why their accounts agree, for the most part, with the Biblical record. The Jews definitely had a motive driving their own version of the life of Christ. 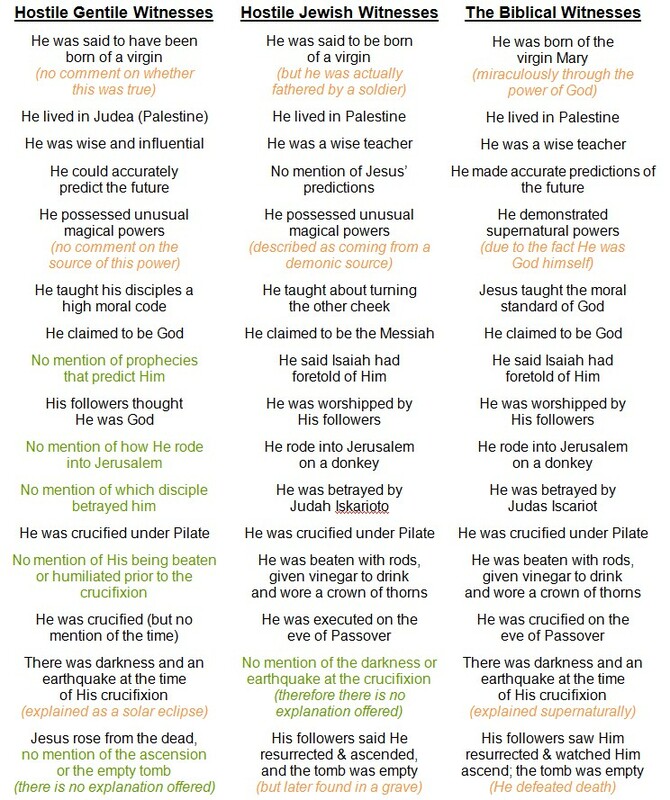 Jesus offensively claimed to be their Messiah. This earned Him the wrath of the Jewish leadership well documented even within the Biblical record. Unlike the Biblical writers, the Jewish leadership had everything to gain (and maintain) by being less than truthful on key points. While the Gentile and Biblical record largely agree, the Jewish record is by far the most inflammatory of the three accounts. Why? The Christian record threatened the power and social structure of first century Judaism. The Jewish leadership had a lot to lose here if Jesus was, in fact, the Messiah. And once he failed to meet their incorrect expectations (as a military Messiah) they determined to represent him in an unfavorable light. The first converts to Christianity were Jewish; a desire on the part of the Jewish establishment to stop people from converting to Christianity would, in and of itself, provide a strong motivation to be less than honest in representing the life of Jesus. When investigating at any event in ancient history, we must evaluate written record and the supporting archeology. As we look at these three witness groups, we must assess them as we would any other set of witnesses. The Biblical eyewitnesses measure up under these standards. They clearly wrote their accounts early, their testimony is supported externally by the archeological evidence, they have a reliable tract record (also supported by the archeology) and they are without ulterior motive. While many skeptics argue only non-biblical sources can be trusted for the information we have about Jesus, the ancient Christian record about Jesus is the most reliable. For a much more extensive evaluation of the Gospels as eyewitness accounts, please refer to Cold-Case Christianity.